Times are hard in the hundred acre wood, not even pooh has been sheltered by the recession…still it’s a bit of a surprise that a pig living in the same place as a bear and a tiger didn't get eaten before. Christopher Robin will never be the same again. 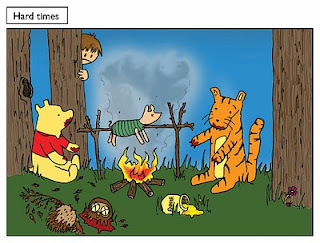 This picture makes me think of pooh and tigger as cannibals but they're just doing what comes naturaly I suppose….bears aren't meant to live soley on honey and I'm pretty sure tigger lived on roo's medicine, roast suckling piglet is a meal that has been long coming. Tiddly-pom. Tiddly-pom.